The UKCAT Quantitative Reasoning test evaluates one’s ability to solve problems using numerical skills. Learn more about the Quantitative Reasoning subtest, and start preparing for it with JobTestPrep. The UKCAT Quantitative Reasoning subtest assesses one’s ability to implement standard numerical skills (GCSE standard) to solve quantitative problems. The questions in this section test you on your problem-solving skills, as opposed to your numerical ability. The UKCAT Quantitative Reasoning section is specifically designed to give everyone an equal opportunity to successfully complete it. A-level maths is not required, but most of the questions on the Quantitative Reasoning section are at least GCSE-level. Start practising today for UKCAT Quantitative Reasoning and see results. Why Is There a UKCAT Quantitative Reasoning Subtest? Medical and dental practitioners frequently need to go over and apply data in their work. Practically speaking, a doctor may need to calculate a patient’s medication dosage based on the patient’s weight, age, and other factors in order to accurately administer the medication. Furthermore, clinical research may necessitate the ability to critique, define, and apply results that are presented in a more complicated form. It is important for universities to know whether or not a candidate has the aptitude to handle such situations. On the UKCAT Quantitative Reasoning section, you must draw out the pertinent information from numerical presentations (such as tables). Each numerical presentation will have four questions that relate to it, each with five possible answer choices, from which you must select the best answer. The Quantitative Reasoning subtest is comprised of nine data sets, making a total of 36 questions. You have 24 minutes to complete this section (plus one minute for instructions). You will be provided with a simple on-screen calculator for this part of the test. The example questions below demonstrate the types of questions you will experience in this test. By going through it with you, we highlight some of the challenges you will come up against in this section. A clothing business is trying to increase its brand awareness through the distribution of advertising items. It has addressed a number of advertising companies for their price quotes. If BrandMad were to increase its prices by 10%, what would be the net change in price of an order that includes 1000 pens, 2000 match boxes, and 300 shirts? 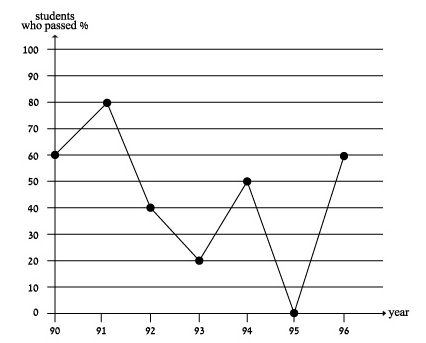 The following diagram describes the percentage of students who passed the exam 'Introduction to Economics' out of those who took the exam at the University of Cambridge between the years 1990–1996. For example, in 1993, 20% of the students who took the exam passed it. It is known that a quarter of the students who passed the exam in 1992 passed it in the first trial. Assuming each exam has two trials, what percent of all the students who took the exam that year passed it in the second trial? For more free samples, check out our free UKCAT practice test. The UKCAT calculator is a TI-108, which is the most basic calculator. It includes the four basic functions as well as square root and percentage keys. In each Quantitative Reasoning question, there is a link to the online calculator on the top left-hand side of the screen. When you click on this link, the UKCAT calculator will appear on your screen. You may either click the buttons using your mouse or by using the number buttons on your keyboard. It is good to know and understand what you can and can’t do with a basic calculator. Brushing up on the different functions you can perform with the calculator will save you time on the test. Preparing with the calculator will help you answer questions more accurately. Some of the common problems with using a basic calculator include inputting the equation into the calculator in the wrong order or getting confused about how to calculate a percentage or a decimal point. You will have to perform more difficult calculations without the help of a calculator. Prepare for these in advance so that you will know how to perform these tasks correctly, quickly, and easily on the test. Practising will help you to become familiar with the calculator, making it quicker for you to input necessary information (numbers, functions, etc). Our UKCAT test preparation pack offers comprehensive solving tips, a mock test, separate Quantitative Reasoning practice tests, and a series of videos to explain some of the mathematical functions required on the test. These tests can be completed in either Timed or Step-by-Step Mode, in which each question comes with a detailed explanation. This method allows you to learn as you prepare for the test. Our online pack also contains a complete guide to the UKCAT, featuring specific tips for the Quantitative Reasoning test. Learn more about UKCAT Quantitative Reasoning tips here. In 2013, the Quantitative Reasoning test was the lowest scoring of the five UKCAT subtests. To achieve an average score (600), you only had to get 16 questions right. These scores are a testament to just how difficult this test was. So just what do you need to do to improve your QR subtest score? Let’s take a closer look at this test. One of the key skills for the Quantitative Reasoning test is mental arithmetic. In this test, you generally need to make more than one calculation to come to the answer, and you must be able to do these calculations quickly and accurately. Sharpening your mental arithmetic skills should be a large part of your UKCAT Quantitative Reasoning preparation. You also need to be clear on how to perform a range of calculations needed to come to the answers. These functions include ratios, percentages, fractions, multiplication, and division, to name but a few. To arrive at the answer, you must work through these calculations steadily, methodically, and in an organised manner. You can use a calculator to help you out with these questions, so practise with an on-screen calculator from the beginning. The most difficult element of the Quantitative Reasoning subtest is answering the questions in the time allocated. Even with this year’s additional two minutes to complete the subtest, test takers have reported struggling to complete the test in the time allowed. So what can you do to get faster? Practise using an on-screen calculator. This will save a lot of time, as you will familiarise yourself with where to move your mouse in order to make calculations. Some people have said their test centre won’t allow them to use the keyboard, so practise using a mouse on the calculator as well. Don’t spend too long on one question. If you find you are spending too long on a question, flag it to go back to later and move on to the next one. Perform easy calculations in your head or on paper. Learn shortcut techniques as part of your preparation. For example, divide the number by 100 in your head when calculating percentages. You may then need to use a calculator to multiply this number by 26%, but at least you have cut out one step. Keep your calculations on your whiteboard. You may find that you need to use the same calculations again in the next question, so writing them down and keeping them to go back to will allow you to skip stages in later questions. The Quantitative Reasoning subtest is difficult, but good preparation of your maths and reasoning skills, as well as practising working through questions quickly, will help you come out with a good score. It is worth taking time to ensure you possess the basic skills before you start preparing. In addition, take practice tests to help you understand the timing. Our UKCAT practice packs contain revision materials for skills, as well as test tips and practice tests. Good luck! The UKCAT and other trademarks are the property of their respective trademark holders. None of the trademark holders are affiliated with JobTestPrep or this website.